TropicSpins - Super Stable, High Performance Heavyweight yo-yo! Tropic Spins first release, the Capricorn, was well received throughout the yo-yo community and received excellent positive reviews. They took that positive energy and charged head on into their next design - Trying to create something different, something new, something truly unique that would stand out in todays market. This is the Shipwreck! The Shipwreck is almost the polar opposite of their first yo-yo, in design and feel, and that is one of the coolest things about it - Tropic Spins didn't play it safe, they created one big, bad beast of a yo-yo that stands on its own! The Shipwreck was designed to give you maximum stability and control throughout your throw, even at low RPMs. It's definitely on the heavier side, but by giving the Shipwreck an exaggerated double rim design, the weight of the yo-yo is focused under the rim and out, giving you a super stable yo-yo that maintains a floaty and moderately fast feel. Perfect for long laid back combos. They matched their unique design with some really cool ano work, a 10 ball bearing, and an an amazing grind worthy finish. If you're looking for a standout yo-yo with outstanding stability and spin time, then look no further! 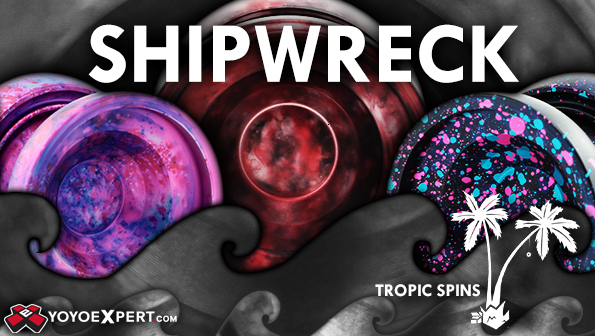 The Shipwreck is an excellent second design to come out of the Tropic Spins workshop and we can't wait to see them continue to move forward as a company!